A kite energy firm has been cleared to extend the period it is allowed to carry out test flying on part of a Scottish military range. 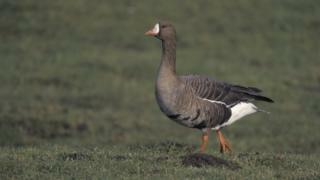 It was initially limited to between mid-April and mid-September to protect white-fronted geese and hen harriers. However, Kite Power Systems applied to have that extended by a month at West Freugh near Stranraer. The move has been approved on condition an ornithologist is on site for the extra month to monitor operations. The company argued that the extension for a month to the middle of October would have no significant effect. However, it offered to have an experienced bird expert on site during the extra weeks who would have the power to stop operations if birds arrived early. RSPB Scotland said it was happy to see test flying continue until 10 October as long as such supervision was provided. KPS has secured significant financial backing for the project since it received planning permission last summer. A £2m equity investment has come from the Scottish Investment Bank and it now has more than 25 staff between its management base in Glasgow and the test site in Dumfries and Galloway.